1. What is the bedding configuration of my apartment? 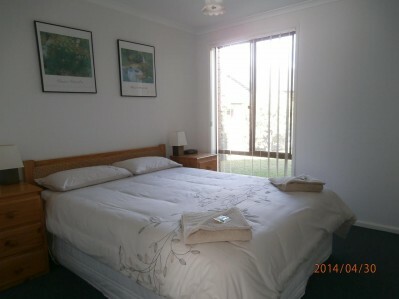 All units have a queen size bed and 2 single beds in the other bedroom/s. We have one unit and one townhouse which have a set of bunks and a single bed in the second bedroom and two townhouses which have a double bed and a single bed in the second bedroom. 2. What is provided in the apartment? The apartments have a fully self contained kitchen with fridge, microwave, oven/stove, saucepans, frypan, utensils, crockery, cutlery and assorted dishes. Most have dishwashers. Dining table and chairs, lounge suite, TV/DVD player and free Austar TV. Bedrooms (most with blankets, some with doonas), bathroom and separate toilet, laundry with washing machine, dryer, iron and ironing board, built-in cupboards and undercover parking or garage. Most have reverse cycle air conditioning. Linen and towels are supplied. 3. Where are you situated? We are situated at 10 Cameron Street, on the town side of Merimbula, 5 minutes flat walk to the shops, Restaurants & Clubs. 5 minutes walk to Spencer Park where there is a childrens play ground, grassy area for kicking a ball and BBQs., this is beside the lake and an ideal place for littlies to swim or play in the sand. 4. What facilities do you have on site? A sealed driveway runs through the complex with apartments and townhouses built either side. Our swimming pool, bbq area and half tennis court are conveniently located half way down the driveway. 5. Do you have phones or internet facilities? We do not have phones in our units but we have wifi internet access for your laptop., or there is an Internet Cafe in town, about 5 minutes walk away. We provide introductory supplies of tea, coffee, sugar, milk, toilet paper and soap. You need to bring these items and all other food and beverages. If you regularly use equipment such as wok, coffee percolator, garlic press etc and can't be without them, then bring them with you. Don't forget the games, toys, DVD's and of course the beach towels. Every one is different, so you can call us on 02 6495 1153 if you are unsure.